Should I Get A Hosted Phone System for My Business? We hear this question a lot from customers and potential customers. Some of them have old, antiquated phone systems, others have somewhat up to date premise-based phone systems. 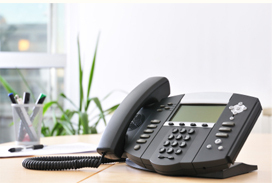 Either way, the question remains: Should I switch to a hosted phone system? Is the answer as simple as “Yes” or “No”? Of course it is! But not right away. Not before the right questions are asked to determine if you business’ infrastructure, connectivity, culture, budget, can handle a hosted phone system or not. If you’ve investigated hosted phone systems for your business before you have no doubt encountered a litany of options. Most of them are between $20 – $30 per “seat” per month depending on what option you want. Some can cost more, if you have advanced features, or a call center setup. Did you get a chance to meet with a sales rep in person? Did they go through qualifying questions to make sure the implementation and ongoing operation and service of the system won’t be a complete disaster? Hopefully. If you do talk to one of the dozens – if not hundreds – of hosted providers, do me a favor; ask them if they’re certain a hosted system is right for your business. See what they say. These companies have one option and one option only… hosted. If you were trying to find the best pickup truck, would you go to a dealership that only sells Ford and expect to get an honest assessment of Ford, Chevy, Toyota, and Nissan trucks? At McEnroe Voice & Data, we have 4 main products. Mitel premise-based, Avaya premise-based, Mitel Hosted (MiCloud), and Star2Star hosted. We intentionally have 2 strategic options in each category because they are all reputable and quality manufacturers whose product(s) offer slight variations that allow us to uniquely qualify each customer. We are the dealership that offers Ford, Chevy, Toyota, and Nissan. This allows us to be a true consultant and figure out the best product for your company, instead of trying to fit your company into one product. There are a bunch of other questions to help qualify a hosted solution, but those will give you a good start. My best advice is to seek out a reputable, local company who has multiple offerings and a good track record. Our goal is not how many users per month we can sign up. Our goal is the right product, the right technology, for each unique customer. This entry was posted on Friday, March 9th, 2018 at 7:31 pm	and is filed under Business phone system, Hosted Phone Systems, Hosted Solution. You can follow any responses to this entry through the RSS 2.0 feed. Both comments and pings are currently closed.